JIMBARAN, Indonesia, Dec 9 (Reuters) – Rich and poor countries failed on Sunday to agree on a plan to open up trade in green goods, with Brazil fearing a major U.S.-EU proposal raised on the fringes of climate talks in Bali was a protectionist ruse. At the end of two days of talks involving officials from 32 nations, including 12 trade ministers, a final news conference descended into farce as Brazil and the United States swapped recriminations. The proposal involves cutting import tariffs on a list of 43 environmentally friendly goods, such as wind turbines and solar panels. If widely supported, it could lead to a global cut in greenhouse gas emissions blamed for climate change. There are many versions of follow the money in climahysteria. We have the good old fashioned Marxist notion of taking from one country and giving to another. We have the “how can we hurt capitalism” version. And, we have the “how can I make some money off of complete idiots, like Michael Moore does?” version. Look, don’t get me wrong, I am all for alternate energy, including solar and wind farms. I have complained many times about Ted “Swimmer” Kennedy blocking the Cape Wind Project. Though it really doesn’t affect me down here in Raleigh, NC, wind farms are a good thing. But, I digress. What we are seeing in Bali is a combination of the first and third. In this case, what they are attempting to do is make sure that poor countries can get materials cheap from 1st world countries, otherwise known as “countries that are productive.” Also, would anyone care to lay a bet that individuals involved in said discussions have a vested monetary interest in making sure that these trade goods are traded? Skiers, fire-eaters and environmental campaigners have joined in demonstrations worldwide to draw attention to climate change and push leaders to take action. From costume parades in Manila to protest by London cyclists, marches and events took place in hundreds of cities and towns across the world Saturday to coincide with the two-week U.N. Climate Change Conference, which runs through the end of the coming week in Bali, Indonesia. Hundreds of people rallied in the Philippines’ capital — wearing miniature windmills atop hats, or framing their faces in cardboard cutouts of the sun. First, they love their marches, along with their petitions and such, don’t they? A nice Saturday, and they spend the day marching. On the bright side, despite turning their kids in to little moonbats, at least they seem to spend time with them, instead of isolating themselves on the computer, screaming obscenities and getting spittle on the screen, which is the norm for them. Well, those they haven’t aborted, anyhow. 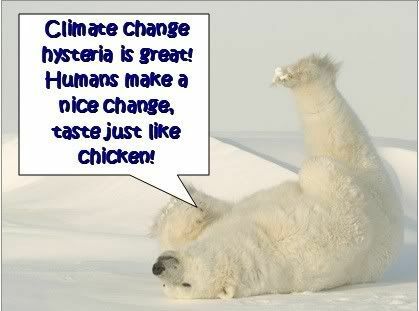 And, do we really need yet another demonstration to draw attention to climate change? Though the Live Earth broadcast from South Africa when it was abnormally cold was a hoot. Young Samantha Gonzales hits on a good point, in between certainly worrying about getting Angelina Jolie (h/t Blue Star Chronicles), every-ones favorite bisexual, to help out against the twin insurgencies of commies and Islamic extremists in the Philippines. We do need to preserve the environment, and the use of more renewable energy can help. But, we should be doing it because God gave Man dominion over the Earth, and it is in our best interest to do so. Not because of silly climate change, which will happen whether we want it to or not, and marching is not going to stop it, nor will windmills and solar energy plants. But, they can help with clean air. As I have said before, what annoys me most regarding this whole climate change idiocy is that true environmental issues get relegated to the background, or we get something like “we need to stop global warming because the corals are dying.” Climate change is not killing the corals: ocean pollution is. But, the climahysterics are more concerned with silly CO2, and, the rest of the environment suffers. Al Gore has come under fire for making personal gain from his mission to save the planet — after charging :£3,300 a minute to deliver a poorly received speech. Many of the audience at last month’s Fortune Forum summit were restless as Mr Gore, who has won both a Nobel Peace Prize and an Oscar for his campaigning work this year, delivered the half-hour speech that netted him :£100,000. That would come to about $203,000 for a half hour speech. Definately read the rest of the story, and see how The Goracle acts. Cross posted at Pirate’s Cove, where I will plant trees in your name for only $100!